Between January and February 2017, wildfires destroyed large areas and small villages in Central and Southern Chile. 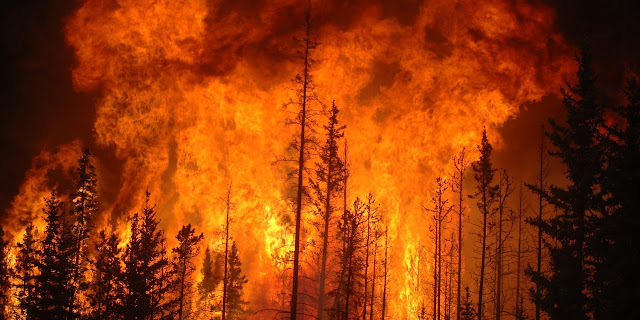 More than 500,000 hectares were burned. It is estimated that after the great earthquakes that have shaken the country in previous years, this series of fires is one of the largest disasters that has had to be faced, not only with national means but also with the help of a large number of private contributions and and the solidarity of many friendly Governments around the World. 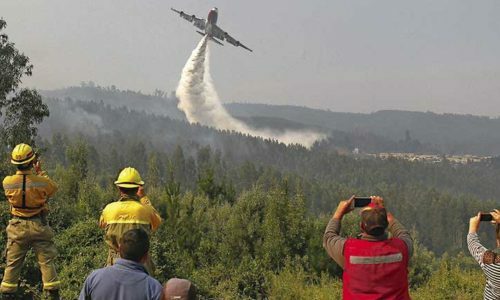 Oustanding was the participation of the firefighters of CONAF (National Forest Corporation); personnel of the Chilean Fire Department; Fire Brigades from many friendly countries such as Argentina, Peru, Colombia, Venezuela, Panama, Mexico, Brazil, Spain, France, Portugal; dozens of helicopters and airplanes that participated in the hard fight against fire, coming from the USA, Brazil, Russia, etc. ; important monetary aid from the United Arab Emirates, China and other countries. 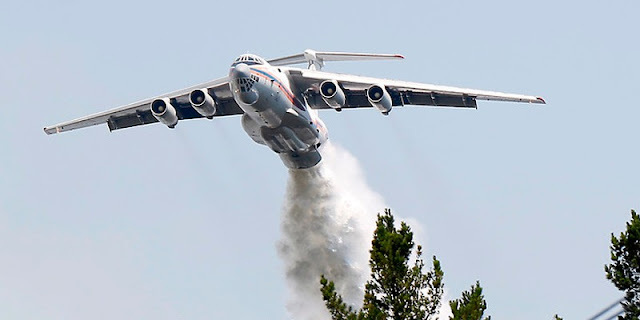 Very emotional were the moments when the fire fighting planes made their discharges of water, the people in sign of gratitude responded with tears and applause. The Russian "Ilyushin" IL76 was affectionately nicknamed "Luchin" (a popular diminutive of the name Luis) because of the similarity of the two voices. SuperTanker in action, a contribution of Lucy Ana Aviles, a Chilean who lives in the USA. Although many tourist centers were not directly affected, others were, and it is estimated that the losses in the sector will be considerable due to the fears that people have to travel to those areas. In fact, tourism has fallen by 35% in the affected regions, this is how Hotel Bookings and many Tours in the damaged regions have been cancelled. One of the alternatives for travelers in the Region of O'Higgins are the tours known as "La Ruta del Vino", which consist of touristic routes to typical and beautiful vineyards. In this area, the losses will be considerable since only in two vineyards several hectares dedicated to this type of tourism were burnt. Another of the strongly affected communes was Vichuquen, on the edge of the lake of the same name. The fire drove away not only the nearly 15,000 people who keep their summer houses there, but also the 50,000 people expected for the season. For all this, and also in support to destinations that work normally, Sernatur (Chile's National Tourism Service) has said that the Government will allocate resources to promote tourism activities in these areas, making alliances with the local media and digital campaigns to demonstrate that destinations are operational, giving a sign of normality. For its part, the Ministry of Finance has announced a set of 14 measures to alleviate the economic situation of people living in the communes declared as a Disaster Area. Sergio Galilea, Undersecretary of Public Works, made a call to visit tourist destinations struck by forest fires, in order to revive economic activity, expressing "Here, are the best beaches in Chile, the best way to solidarize with them is coming to Pichilemu, Matanzas, Navidad, Dichato, Santa Cruz and Vichuquen." It should also be noted that Central and Southern Chile are also rich in other important tourist centers not mentioned here, as they were little or no affected, such as Termas and Nevados de Chillan, Huilo Huilo Biological Reserve, Los Lagos Region (Region of the Lakes) including Puerto Varas, Frutillar, the tourist resort of Pucon and all its beautiful surroundings, etc., etc.